Last night my young friend Harrison and I worked out we could give four children three meals a day for nearly a year with the money raised during our recent Bake Sale for No Kid Hungry. I set a goal of $300 for the sale. Share Our Strength recommends a goal of $700. But this wasn't going to be a "send out press releases and recruit the masses" sale---only a "set up a table and see who brought cash with them to dance class" sale. We raised $403.04. No Kid Hungry connects children with 10 healthy meals for every dollar. That's 4,030 meals! Harrison's idea was to divide 4,030 by 3, which gave us 1,343 remainder 1. That's 1,343 days of 3 meals a day, plus an extra meal. Then we divided 1,343 by 365 to see what that means in years. That took a little longer, and we had to use pen and paper. The result was 3 years and 248 days of 3 meals a day (plus the extra meal from before). Done another way (dividing 1,343 three-meal days among 4 kids), we get 335 remainder 3. That means those 4 children get 3 meals a day for 335 days, and 3 of them get another day. We want to feed them all equally, so let's multiply out the extra 3 three-meal days to get 9 meals. Let's add the extra meal from above (the remainder from figuring out the number of three-meal days) and we get 10 meals. Divide 10 meals among 4 children, and each kid gets 2 1/2 meals. So with the money from our sale, we're feeding 4 kids 3 meals a day for 335 days, plus 2 1/2 meals on the 336th day. Not bad. 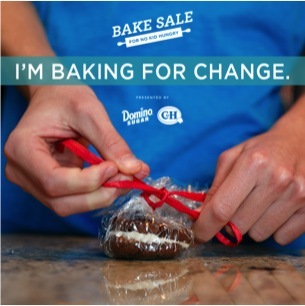 But during the month of November, Domino and C&H sugar are matching all bake sale proceeds. How many children can we feed with $806.08? Some friends and I will be hosting a bake sale to benefit No Kid Hungry at the Dance Center-School of Performing Arts October 6 - 9. Exact times depend on community involvement, but I'll keep you updated. 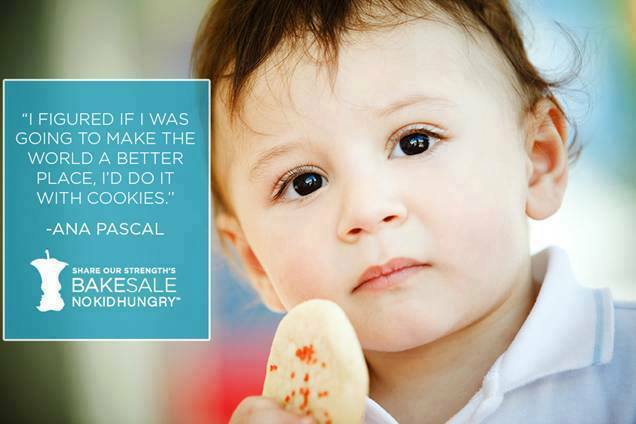 Let's work together to end child hunger! First of all, yes, this is a cheater pie made with cherry pie filling from a can. I love a homemade cherry pie, but we don't grow cherries in Louisiana so I buy canned filling and enjoy it. Very much. I meant to take pictures of the pie at each step of the way, but I was so excited to complete the next step . . . This pie was very well received by my family, and took barely any time to make. Put first 3 ingredients in fo﻿od processor and pulse until dough forms a ball. Press into a 9 - 10 inch pie plate. Put next 3 ingredients in food processor and blend. Pour and scrape into crust. It doesn't matter if some crust crumbs get on this layer, since it will be covered by the cherries. Bake at 425 degrees Fahrenheit for 15 - 20 minutes. Top will be cracked and slightly golden. Spread pie filling on top. I'm a little late posting this, and if the winter greens are finished in your part of the world, you'll just have to print this recipe for next year. Nobody in my family enjoys collards, so my son recommended we make pesto from the ones we got from our CSA. After telling him collards aren't pesto greens, I looked it up on the internet. And it turns out they are. Here's my version of the recipe, tweaked to please my little family. 1. Blanch greens in boiling water to cover for 1 minute; drain. Plunge into ice water to stop the cooking process; drain well. 2. Roughly chop garlic. Toast pecans in dry pan over low heat. Process garlic and pecans in a food processor until finely ground. Add greens, olives, cheese, herbs, salt, and 1/2 cup oil; process until smooth, stopping to scrape down sides. Add more oil if necessary to achieve desired consistency. We had this the first night over rice pasta with black olives and extra parmesan. Yum! But spread on pitas, topped with mozzarella cheese, and baked at 425 degrees Fahrenheit for 10 minutes it was a real hit. If you're looking for a new way to eat your greens, give this a try!